Field Report: 2014-12-11 Our First Real-World Drip Sensor Data! Our sites were all close to survey stations, so we can work out the locations for top side sensor co-deployments later. Trish retrieved the first generation of drip sensors from Rio Secreto yesterday, but we did not have time to open them up until this morning. So breakfast consisted of me concatenating the separate csv files, while she brought some substantial spreadsheet whammy to bear analyzing the data. We were both pretty excited to find that the first generation of drip sensors had actually worked, and I can only imagine how our little science/nerd fest looked to the other folks at the Turtle Bay Cafe, as they nursed their Mexican holiday hangovers with caffeine. Trish described how one of our installation sites had experienced a flooding event, which knocked over some of the the sensors. While she was re-assembling the scattered stations, she recorded another set of manual drip counts, so we could verify our numbers. Shortly after the deployment in August, I had made the unwelcome discovery that many of those early drip loggers had been deployed with fake SD cards, which use excessive amounts of power. But I had also installed lithium batteries to provide a bit more juice (~2900 mAh/cell), and I was happy to see that four of the original six units were still running. Whew! Fernanda Lasas, who kept an eye on our little loggers during this deployment, confirmed that there was indeed an event, with rainfall and a jump in the local water table, right around that first point of inflection, and that it was “pretty rainy” for more than a month after that. This resolved that question I had about the validity of data from DS03, which had failed early. 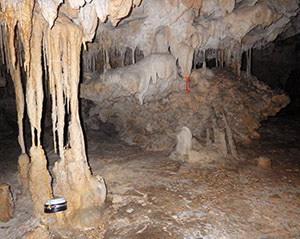 While there was considerable variability in drip counts from one stalagmite to the next (as predicted by my wife back in August…), we saw congruent trends in the different records from this chamber. With so few stations in this first deployment, I am not sure what else one could say at this point. While it doesn’t take a rocket scientist to see when the unit was knocked over, I have added a once-per-day x,y,z axis reading to the code, so we can be more certain that the sensors hold a fixed position on future deployments. You do see that spike reflected in the readings from the other chamber, although it was muted against the higher base rate. And it’s even good to see a long string of zeros in the data, as this tells me that my sensors are not generating false positives from internal noise. Accelerometers can be twitchy when you run them at high sensitivity. While that’s not a Danish performance test, it shows me that the Cave Pearls really do need to get sleep currents below 0.3 mA if I’m going to get a year out of three AA’s. You do not see that distinct “shoulder & elbow” pattern (see DS05) in the discharge curve of alkaline batteries, which give you a nice gradual decline in voltage. If a set of lithium cells is going to die while they are still at 4.4 volts, I need to raise the cut-off in the code to protect my data. Unit 3 did have a corrupt file on the SD card, so I probably lost a couple of weeks there by not intercepting the SD writes soon enough. I have reduced the number of records per file, which will put less information at risk from a lost file like this, though it means more work stitching the data together later. It took us most of the day to sift through it all, but in the evening I still had a time to fire up a few new units, and review the overnights from the ones I had started the day before. In the process I discovered a problem with the new humidity sensors I had cobbled together just before the trip, which were claiming that our room hit 200% RH sometime around noon. The raw data looked fine, so I suspected a problem with the floating point calculations on the Arduino; something I ran into with the temperature sensors. I locked them into a bag with some desiccant packages to see if forcing them into a low range over night would help me isolate the problem. They were still running the code that had performed beautifully back home, but during those tests they not been exposed to such high humidity for significant amounts of time. I am happy to report that all of these first generation drip sensors went down to ~0.33mA after I replaced the fake SD cards. And only one of those first gen units was built with Rocket Ultra, the rest were a variety of cheap Pro-Mini style clones from eBay. 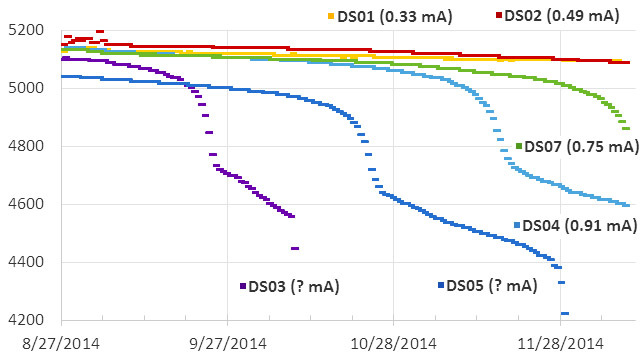 I will leave the existing batteries in DS01, so that the next deployment gives me more of that discharge curve. Another little gem lies in the record for DS04, which had a sleep current just under one milliamp. That unit looks like it would have gone another couple of weeks before hitting the rapid fall-off at 4.4v , giving about 4 months of operation. Now 4(months) x 30(days) x 24 (hours) = 2880, which, more or less, is the number of milliamp hours you get from a single AA battery. But the drip loggers have three batteries, so my ‘live’ duty cycle power drain is roughly 2x that being consumed when the unit is sleeping. DS04 wrote about 10000 records to the SD card and with 64 records buffered to the 4k eeprom on the RTC, that translates to about 160 SD card write events. The cumulative drip count approached 11000. The drip-interrupt routine does not do very much so I think writing data to the eeprom & SD card are my biggest power users. The new generation units have 32k eeproms, and I have them set to buffer a range from 96 to 512 records to see if I can quantify that power use a bit better. A friend put me onto a way of graphing battery capacity in a way I had never seen before: Ragone Plots. I am still wrapping my head around the idea, but the convergence of all those battery power curves seems to indicate that there is very little advantage to using lithium batteries in low power applications like data loggers unless you need to operate at very cold temperatures. Just breezing over some of these older posts, and realized the mistake I made on 2015-01-07. When you put batteries in series you add voltage, but not power, so 2880 mAh would have been the budget for the entire battery pack. Fortunately for me, the blog traffic was so low back then that no one pointed out the gaff. I’m leaving it in, as it shows what kind of a learning curve I was on at that point, and the project continues to progress despite my many misunderstandings. This entry was posted in Developing a DRIP ⚶ sensor, Expedition Reports & Updates on January 6, 2015 by edmallon.